1776, a year renowned in American history for the writing of the Declaration of Independence and several engagements with the British, was also the date of the founding of the Mission Dolores and the Presidio of San Francisco by Spanish explorers. While the original 13 British colonies were busy throwing off the mantle of the Old World, and the Russians were claiming the northern Pacific Coast, Spain was anxious to obtain a better understanding of the state of its holdings in New Spain, and shore up its military and governmental systems for aid in supply routes and to further its permanent settlements in Native American territory. The missionaries in the remote interior regions of New Mexico were still dependent upon the crown, and with its recent acquisition of the Louisiana territory, Spain had a considerable empire to manage from afar. Fray Francisco Atanasio Domínguez was tasked to lead an investigation and make a report on the economic and social conditions of the New Mexico missions in villas and pueblos, and to search for new routes to connect with the newly established Spanish missions in Alta California. While Domínguez (with his brother explorer Fray Silvestre Vélez de Escalante) did not find a northern route to Monterey, he did make a detailed report of the status of the Spanish settlements in New Mexico. He found the church buildings and friars in need of serious attention, and was not shy about their perceived shortcomings, so much so that the Mexico City native was met with resentment, and his report was filed away and forgotten by all. His manuscript was rediscovered in 1928 at the National Library of Mexico by Dr. France V. Scholes, and in 1958 the first English language version was published by Eleanor B. Adams and Fray Angélico Chávez. Full of details about the everyday life, the buildings, and the people of the northern frontier of New Spain, this important volume also includes letters, maps, and lists of Franciscans and settlers in the region. In the Bicentennial year 1976, the New Mexico Cultural Properties Review Committee sponsored a follow-up publication to document New Mexico’s missions after 1776. John L. Kessell compiled various more modern day observations of Domínguez’s original missions, and presents the update along with drawings and photographs of the still extant buildings. Presented in the same order as the original work, it is easy for the reader to grasp the full history of 18th century missions, which played a vital role in New Mexico’s history. 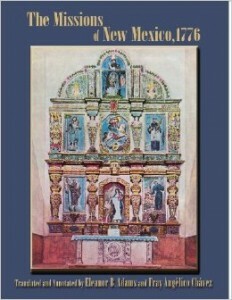 The Missions of New Mexico Since 1776 by John L. Kessell, 1980 (reprinted Sunstone Press, 2012).